Known as ‘The key to England’, the great fortress of Dover Castle has played a crucial role in the defence of the realm for over nine centuries. Its spectacular site above the famous ‘White Cliffs’ was originally an Iron Age hill fort, and still houses a Roman lighthouse, one of the best-preserved in Europe. The Anglo-Saxon church beside it was once part of a Saxon fortified settlement. The tradition of a strong British, or Celtic, fortress having occupied the high cliff of Dover is justified by still existing traces, and here, as elsewhere, the Romans, taking possession of the earlier position, established a camp, or castrum ; their Pharos, with its base of Roman masonry, still standing in proof of their occupation, while the lines of the castrum can be partly traced to this day. Saxon times have left but small records on these heights; but that a strong fortalice, probably of timber and some masonry, existed inside the Roman work, is evident from the undertaking made by Harold, when in the power of Duke William, to deliver to him this castle with its well, showing how William’s mind had long been set on acquiring the important post of Dover. But all vestiges of this primitive fortress have vanished, save in the foundation of a strong rubble rampart which runs along the upper edge of the Roman work. The Saxon work was formed between the existing Inner Ward and the edge of the cliff towards the S.W., and included in a broad circular sweep of wall the Pharos and the early church. Its approach was on the S.V. towards the same Colton Tower through which the visitor enters to-day, and there was on the opposite side of the enceinte, northwards, a more strongly fortified gatehouse with its great well (the same being still in use on the parade ground), with its “Well” towers and gateway. There were afterwards three other towers erected on this southern side of the Saxon fort, outside of it and detached. The one on the E. which defended Earl Godwin’s Entrance on that side, was square and was called after Sir Geoffry Clinton, treasurer to Henry I. This tower, or its foundations, remained till 1994. The next was a drum tower at the salient of the enclosure, at edge of cliff, bearing the name of Sir William Valence, of the reign of Henry III., and was afterwards called the Mill Tower. The third was on the S.W., a heavy work in front of the Colton Gateway, named after Sir Ralph Mortimer, who is best known from his successes at Wigmore and on the Welsh Marches in the reigns of Edward I. and II. A fragment of the base of this old tower still remains embedded in the solid chalk. The tower over the Colton Gate, with its octagonal turret, originally a Saxon work, has undergone much alteration and has now an Edwardian appearance. It bears the arms of I,ord Burghersh who commanded here (temp. Edward III. ), when it seems that the top of the Roman Pharos was built under Constable Richard de Grey, whose arms :re sculptured upon it; but nothing else remains of the three other towers which have been sacrificed, certainly without necessity, at carious periods to the fancies of presiding engineers in comparatively late times. The next stage is that of the Norman fortress which we possess, in which the defensive works were carried out upon a scale far more extended than was adopted elsewhere in this country. It is a concentric fortification, in which, since water defences were of necessity absent, security had to be sought chiefly in its massive walls, encrusted with flanking towers, and in the mutual support afforded between these and certain detached towers and outworks. The immense outer circuit of walls, enclosing at area of thirty-five acres, started from the Monks’ or Canons’ Tower (now vanished) on the S.W. at the edge of the cliff, and proceeding northward to its salient returned again to the edge of the precipice above the sea on the S.E., its trice being somewhat that of a hyperbola. This outer curtain is studded throughout its length with nnm:d towers, twenty-seven in number, some round-fronted and others square ; frequently open in rear, they were built al irregular distances, and some larger ones contained gateways and entrances. Each of these towers bore a special name. 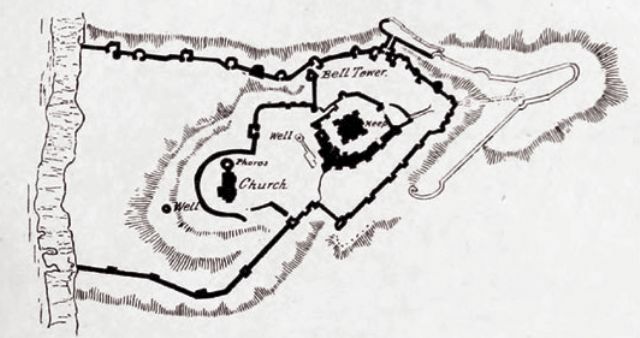 In the middle of this Outer Ward is the Inner Ward, consisting of a lofty wall and fourteen square watch-towers contained in its circuit, haying a defensible gateway on both its N. and S. baces, and the trace of the walls forming a sort of oval. In the centre of it stands the great Norman keep, reputed to have been commenced by Prince Henry, son of the Empress Maud, in 1153, before he came to the throne. The importance of Dover had been fully recognised, as a port, in Saxon times, when it was regarded as the key of England ; but the real history of the place begins with the Charter of Edward the Confessor to the Cinque Ports, which consisted of Hastings, Romney, Hythe, Dover, and Sandwich, with Winchelsea and Rye as members ; and at this time we have in the oath of Harold to Duke William clear evidence that a strong castle then existed on these heights. 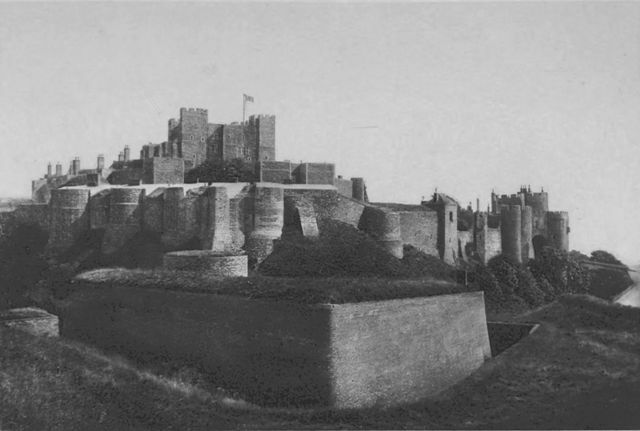 It was not long after Senlac that the Conqueror turned on Dover, whose castle, William of Poictiers tells us, was impregnable ; the town, too, .vas of considerable size, and the population numerous and strongly anti-Norman, but having no leader they were powerless, and both town and castle were at once surrendered. Then William, who treated the people with lenity, placed a Norman garrison in the castle, and having remained there eight clays, and strengthened its defences, proceeded to Canterbury and Rochester, leaving Kent in the charge of Odo, Bishop of Bayeux, his half brother. After this quiet prevailed here for eight years, but in 1174 the men of Kent, headed by Eustace, Count of Boulogne, the brother-in-law of the Confessor, revolted and laid siege to the castle in the absence of Odo, who, however, obtained outside aid, and obliged the besiegers to retire. Although a fortress of such national importance, Dover Castle has but few records of any particular interest throughout Plantagenet and Tudor times. Its constables, whose list amounts to 138, were always appointed by the Crown, from the clays of the Conqueror, who gave the post in perpetual tenure to John de Fiennes, whom he also made Warden of the Cinque Ports. This castellan was assisted by eight subsidiary confederate knights, who held their lands elsewhere on the service of the castle guard at Dover, each of them having to furnish a certain number of warders for so many days in each year. These knights were (1) William d’Albrincis, lord of Folkestone; (2) Fulbert de Dover, lord of Chilham (q.v.) ; (3) William d’Arsic; (4) Geoffrey Peverell ; (5) William Maminot ; (6) Robert de Port ; (7) Hugh de Crevecoeur ; (8) Adam Fitzwilliam. Three of the Fiennes family held this post during the reigns of William I. and II., and Henry I., and in their time the main outer wall seems to have been completed by the building of a large number of watch towers and gatehouses, which received the names of the above knights and their successors. Walchelin Maminot, though appointed constable by Stephen, held the castle against him in 1137, and then yielded it to the Empress Maud. King Stephen died at Dover, in all probability in the castle, and Henry II., immediately on his accession in 1154, is believed to have built the great Norman keep, and the wall and towers of the Inner Ward during the constableship of one of the Fiennes. Henry came to Dover in 1158, and, on the death of his brother, Geoffry, assembled here an army for the invasion of the territory of Nantes, claimed by him after Geoffry. Richard Coeur de Lion was here when fitting out the fleet of 180 sail, with which he crossed to Gravelines on his way overland to Palestine for the Crusade. It was here that King John is said to have clone his degrading homage to Pandolf, the Papal Legate ; and at the end of his reign he appointed as Constable of Dover, his faithful servant, Hubert de Burgh, who defended the castle with great determination against the Dauphin in 1216. Louis, coming to the assistance of the barons with a promise from them of the succession, brought over a strong French army, which, being supplied with siege artillery and all the best military engines of the clay, closely besieged Dover Castle. A covered way, or trench, was opened against the N.W. face, and also at the northern salient, where, after the siege, de Burgh formed the great outwork as an additional defence, with its underground passages, which still exists. The French attack was manfully withstood, and a reinforcement of 400 men was introduced by Sir Stephen Penchester when matters were becoming clinic-tilt with the garrison. At last, after the death of John, and the defeat of a Blench fleet bearing relays of soldiers, the Dauphin retreated, and, his cause being hopeless, returned to his own country. Henry III. came here in state in 1255 ; but four years later his rebel barons held Dover, until the King recovered it from Hugh le Bigot, whom they had made castellan. Then, in 1263, the surrender of this castle was insisted on by the barons on the conclusion of a truce with the King, and it was handed over by Prince Edward. But this did not prevent the faithless King from making, four months after, an attack upon Dover, which Richard de Grey, the constable, successfully resisted, turning back the King and Prince Edward from the gates. After the victory of the barons at Lewes in 1264, their most dangerous foe, Prince Edward, was sent prisoner to Dover Castle under the custody of his cousin Henry de Montfort, and his ride to Dover under such altered circumstances was a popular topic of ridicule in those days (Blaauw). In the following February (1265), Eleanor, Countess of Leicester, when things began to look gloomy for her husband, leaving Odiham (q.v. Hants) came for security to Dover, where her eldest son Henry was still constable, and where were then gathered a large number of de Montfort’s supporters. 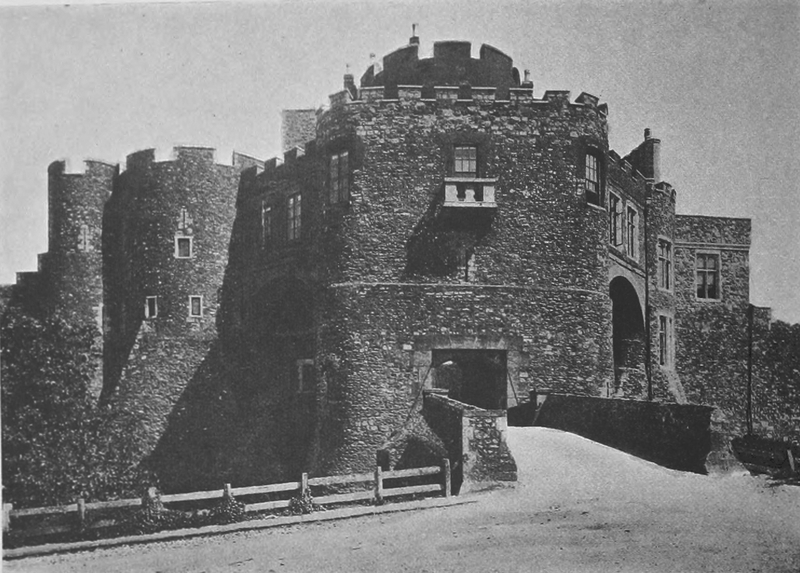 After Evesham and the slaughter of her husband, the widowed countess was banished by her brother, King Henry, and left Dover for France ; and at this time it was that, with the help of twelve Royalist prisoners confined there, who had seized two of the towers, Prince Edward obtained possession of Dover Castle, which thenceforth remained Royal property till the war of the seventeenth century. Edward I. came as King to Dover in 1274, landing here on his return from the Holy Iand, and he generally used the port for his departure when repairing to the continent. The great Constable’s Tourer and St. John’s Postern are probably of the early period of this reign. Edward II. came here on several occasions early in his reign, and went hence to Boulogne on the occasion of his marriage, and here he received his bride on her arrival. Edward III. was often at Dover Castle, and started thence on his secret expedition by night to Calais on receiving news of the intended treason of the governor of that fortress ; and in 1347 Queen Philippa lodged at the castle before joining the King at Calais. Henry V. also used Dover for his port of departure on his last expedition to France, and here he entertained the Emperor Sigismund. We hear nothing of Dover during the Wars of the Roses, but in 1520 Henry VIII. came there with Wolsey to receive with great state in the castle the Emperor Charles, and they continued here for five days. It is likely that when this King was spending large sums in fortifying the coast against an expected attack by the Catholic powers, particularly in the immediate vicinity of Dover, he did not neglect this fortress. Charles I’s Queen, Henrietta Maria, came hither as a bride in 1625, and it was in this castle that she bade farewell to the King on her return to France in 1642. At this time the fortress must have fallen into a state of neglect and disrepair, and its Royalist garrison must have been reduced, as it was won over to the Parliamentary side by a Dover merchant named Drake, who with only twelve followers managed to get round, in the night, to the N.E. angle of the outer walls at the edge of the cliff. They scaled the wall with ropes, and overpowering a sentry, obtained command of the gate, whereupon the officer in charge, deceived as to the strength of the party, yielded the castle to them. Then Drake, sending to Canterbury, obtained 120 men to enable him to retain what he had so strangely captured, and when the Royalists attempted to retake the fortress, so strong a force was sent against them that they retreated, and Dover remained in the hands of the Parliament. After this the place was allowed to moulder and decay, and appears to have been quite neglected until the days of the French Revolution and the war, when the Government deemed it necessary that so important a fortress should be placed in a state of security and adequately occupied. The outer curtain wall, with its numerous towers already spoken of, rises straight from the counterscarp of its broad and deep ditch, and these mural towers act as buttresses to it, besides affording a flanking support at all points ; those on the W. are generally open bastions, which must have been fitted within with wooden platforms and allures ; on the E. there are turrets also of smaller dimensions, while five of these bastions are connected with gateways. Starting from the vanished Canon’s Tower at the S.W. commencement of the wall—(1) is the Rokesley Tower ; (2) is Fulbert’s, once used as a prison ; (3) is Hirst’s Tower, at an angle of the wall ; (4) is d’Arsic’s ; (5) Gatton’s ; and (6) Peverell’s, or the Marshal’s Tower, which formed one side also of an inner gatehouse dividing the Outer Ward into two divisions, and provided with a ditch on its S. front, and with a drawbridge. The 7th was Port’s, or Queen ;Mary’s, having been repaired in that reign. The 8th is Fiennes, or the Constable’s Tower, and is one of the grandest in the country; it presents a salient in its centre, supported at each of its extremities by two circular towers, and having a central tower rising in the midst and dominating the whole fabric. Its entrance is vaulted and is furnished with gates and a portcullis ; the ditch in front, 50 feet deep, being crossed by a drawbridge. The whole is of the Decorated Period. The names of the towers thence, going N., are : (9) The Clopton, or Treasurer’s; (10) God’s-foes; (11 Crevecoeur’s. Here again is a bastion of the first importance, and of considerable extent ; first come two circular strong towers, connected by a short curtain, which extends in great strength eastwards, having four other circular and smaller towers in its length. Its name in Henry III.’s reign was changed to that of the Earl of Norfolk, in honour of the commander, Hugh le Bigot ; its province was to command the ancient approach and bridge from the landward side. From the base of this work there is a covered gallery of descent into the outer ditch to the round tower, called St. John’s, built in the centre of the ditch for enfilade purposes, and this gallery is continued through the tower and counterscarp into a circular chamber underground, from whence three galleries branch off to different points : one to an old postern and another to a work of Hubert de Burgh’s, now converted into a ravelin. The French attack in 1216 was directed against this salient of the fortress. The 17th tower is Fitzwilliam’s, and was connected with another postern, and at present has a caponniere ; then come 18 and 19, being too unnamed watch towers, and beyond them is (20) Avranche’s Tower, at a re-entering angle which contains another postern ; it commands the S. ditch, and behind it is (21) Penchester’s Tower which adjoined the wall closing the division of the Outer Ward on the E. side. Beyond were five more mural towers along the wall up to the edge of the cliff, three of them being called the Ashford Towers ; but this part of the outer defences has been remodelled, the old Anglo-Norman wall having disappeared. The Inner Ward of Henry II. is an irregular polygon, and of its fourteen square mural towers, two on the S.W. have the name of Maminot, and one that of Gore ; they are all built of flint rubble with ashlar quoins, and some of these towers have bold garderobe machicolations. Within the area, built against the wall, are many apartments and buildings, mostly of Early English construction, the largest being Arthur’s Hall, used as a mess-room, with a gallery, and the others being now officers’ and other quarters, and Offices of the garrison. There are two entrances into this Ward, the King’s Gate on the N. and the Palace Gate at the S. end, having vaulted passages and square flanking towers, with a portcullis groove ; each gate has an outwork, that on the N. being perfect, but the one at the S. gate is nearly destroyed ; and the whole was enclosed by a broad and deep ditch, which is now absent on the S.
The keep is a fine example of late Norman work—its date about 1154; it is almost a square of 98 and 96 feet, the total height to top of turrets being 95 feet ; the base of the keep is 373 feet above high water level. The angles are supported by broad pilasters, having a bold projection of 5 feet, meeting at the corners ; and in the centre of three of the faces is another pilaster. The whole of the E. face, from ground level to the string course of the second storey, is occupied with the fore-building, containing the main entrance stairs which lead to the doorway on the second floor ; in it are also ;r chapel on the first floor, and an oratory over this, with one or two small rooms ; this out-building is strengthened by three separate towers of its own. The walls of the keep are of immense and unusual thickness, being at the basement from 17 to 21 feet through ; this allows of . a great many mural vaulted chambers and galleries, which in the lowest storey are now used as water tanks and powder magazines. A centre wall, as in other Norman keeps, divides the interior into two almost equal parts from basement to roof, and in the N.E. and S.W. corners are two wide well staircases giving access to the different floors. The two rooms on the first floor measure each about 52 feet by 22 feet, having numerous recesses and chambers contrived in the walls, and lighted originally by loopholes only.